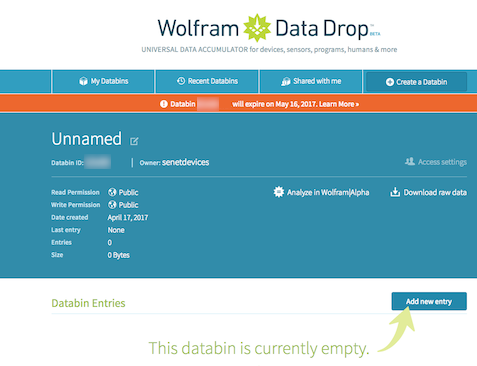 The Wolfram Data Drop (wolframcloud.com) platform allows message data to be delivered to a specified Databin ID. Once the data has been delivered to Wolfram it can be easily configured for computation, visualization, analysis, querying, or other operations. Messages will forwarded in JSON format (See Default Data Fields). From the Wolfram DataDrop platform click on "My Databins" and then click on the "Create a Databin" button. Click on the edit icon next to "Unnamed", give your databin a name. Take note of the Databin ID. Select the Wolfram Datadrop Notification Target and specify the Databin ID that you created for this device.